In three days of fundraising, we’ve raised over $20,000 for Adnan’s legal defense fund. I am incredibly grateful for the kindness and generosity of both friends and strangers, and we’ve only just begun. If you enjoy my blog, and get something out of it, a request that you please donate if you haven’t done so already. It doesn’t have to be a lot, whatever you can give. Here is where you can give to his fund. Just to bring some clarity, the fund is not a 501(c)(3) charity and therefore your donations aren’t tax deductible (don’t hold me to that, but I think thats right). Right now the funds go straight into an attorney escrow account (held by another attorney, not me) and will be transferred to a Trust account that is currently being formed (tons of legal formalities to get through), which will be managed by a Board of Trustees. That Board, comprised of a group of volunteer attorneys, will direct usage of the funds, all of which will be used to help exonerate Adnan, and includes legal and attorney fees and investigative efforts. No one on the Board represents Adnan in a legal capacity, and no one who represents Adnan in a legal capacity will serve on the Board. Ok, now that that’s out of the way, lets get to some more documents. I said a number of times that I’d release the full trial transcripts after the show was over. Until now, I’ve been just sharing parts of the transcript that related directly somehow to the issues raised in each episode (because what’s the point of dumping hundreds of pages and then saying yeah, somewhere in there is a relevant passage to today’s episode?). But now that its over, I face another dilemma. 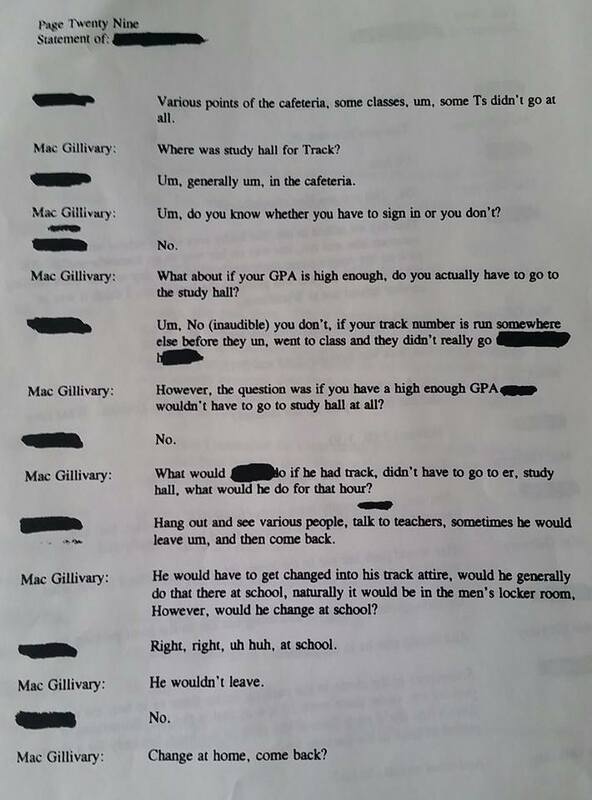 If I share the transcripts, they’re full of personal information. Full names of witnesses, addresses, employers, etc. 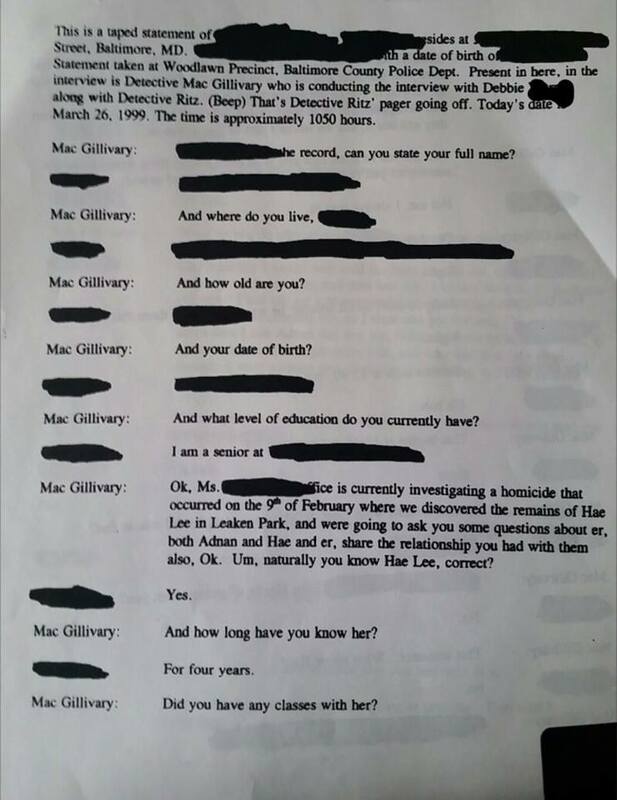 They are all public documents so I have no legal duty to redact any of it. And none of the witnesses have any right or expectation of privacy either, having testified in public proceedings – none of the testimony is under seal. Having said that, I’ve been following Serial’s lead on the treatment of the people involved. If someone gave Sarah permission to use their full name, like Jen Pusateri, I’d use it too. If another person didn’t, I wouldn’t. 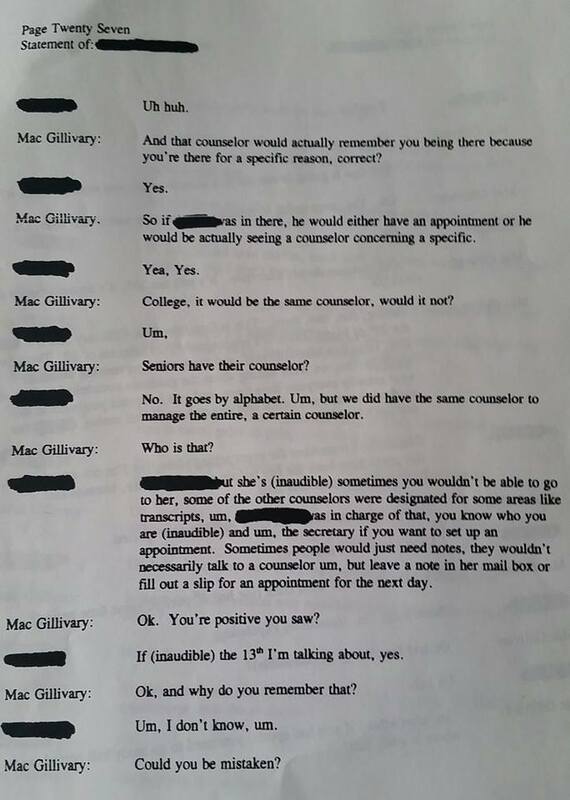 So if I’m to continue that, but try to release the trial transcripts, well it will take me a year just do to the redactions. And that’s not happening. 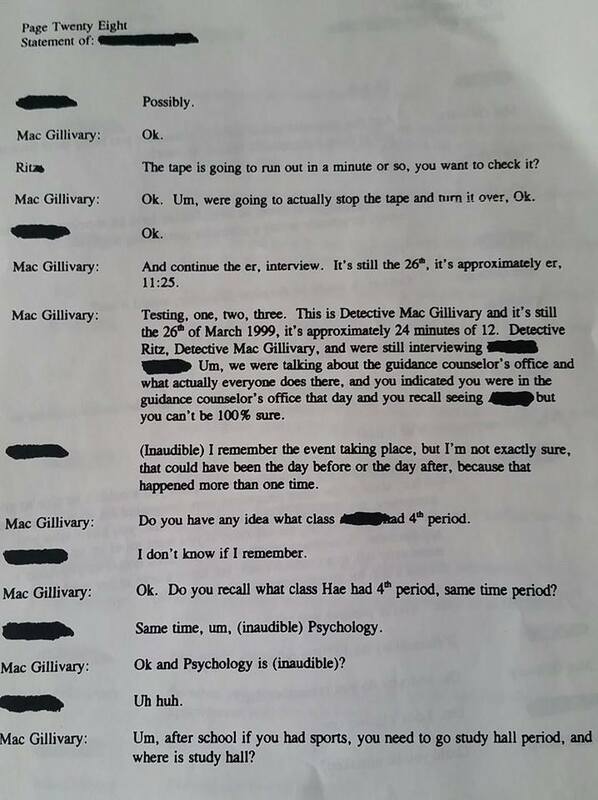 So, what I may do going forward is release chunks of testimony and parts of the trial (opening, closing, etc) that will be easier for me to redact and present it one step/witness at a time. I’m sure some folks will want to read pages and pages of Gutierrez arguing pretrial motions, but most won’t. I tweeted over the weekend that for every $10K we raise, I’d release more documents. So I owe you two documents. Here they are. 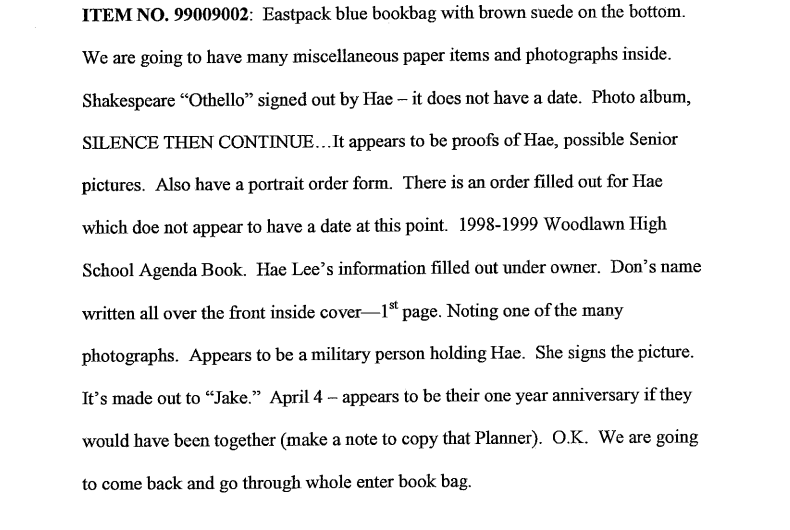 1) I’ve been wanting to find a copy of the evidence gathered from the crime scene and Hae’s car that is clear, not spread out between documents, not mixed up with evidence gathered from Adnan’s house and car (which I’ll also share later), and not stuck between pages and pages of scribbled attorney notes and irrelevant stuff. The best I’ve seen so far is from an evidence review that was taped and transcribed in November 1999 by Adnan’s legal team. 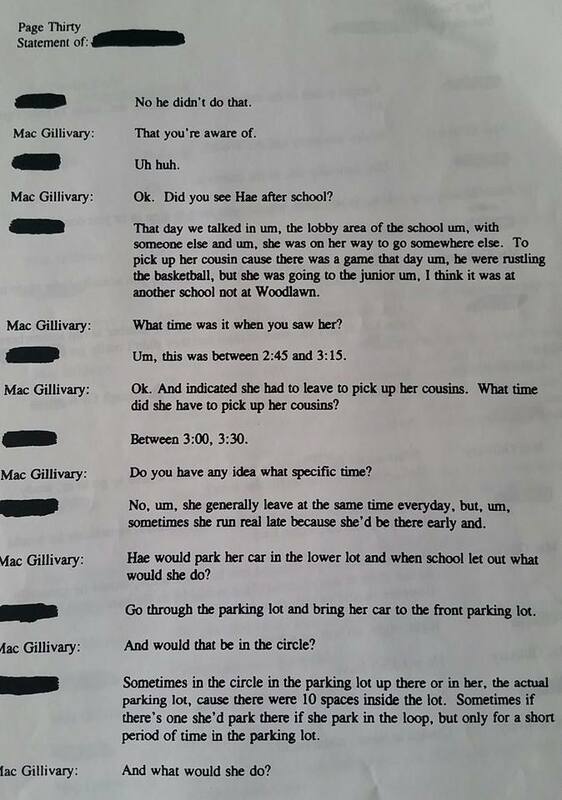 The evidence review is a bit all over the place, jumps from Adnan’s stuff to Hae’s stuff, so for now just sharing the evidence gathered from Hae’s vehicle. 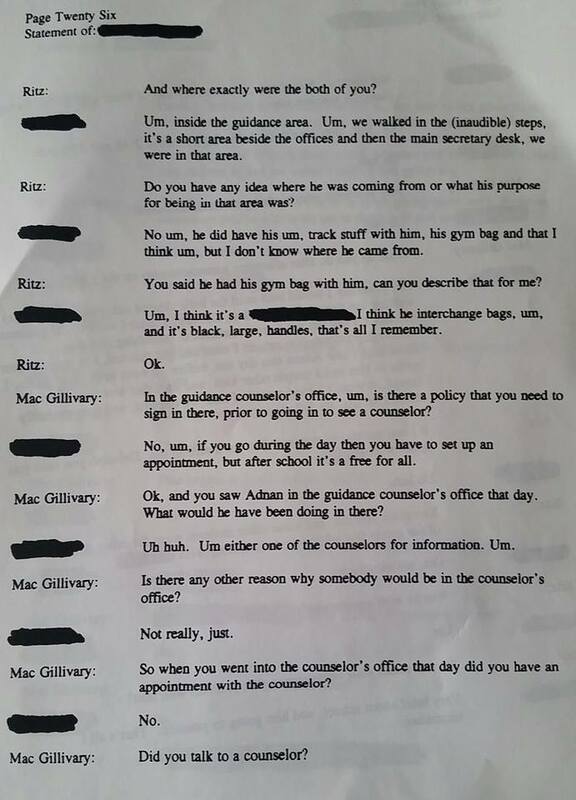 2) A while ago I blogged about reading testimony that stated Adnan was seen before track practice in his track clothing on Jan 13th, but then I couldn’t find it. I couldn’t find it because I kept going through my electronic files and it turned up being a hard documen. 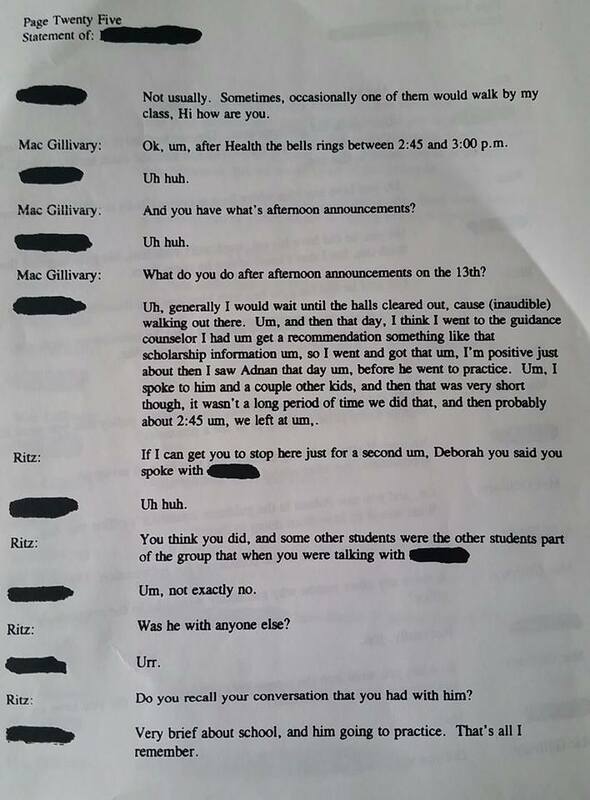 It’s a police interview of Debbie, who was a friend of Hae and Adnan and went to school with them. What bothers me about this (and lots of other interviews) is that they were taken AFTER Adnan was arrested. 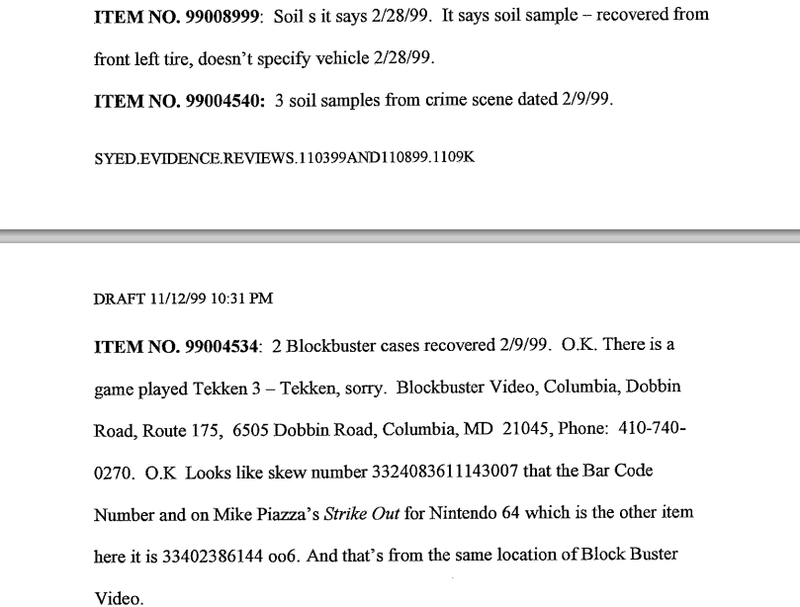 It makes very little sense that the detectives were “investigating” after making an arrest instead of prior to it – other than the fact that it can really taint the memory of the witness after the fact…and maybe that’s what they were hoping for. 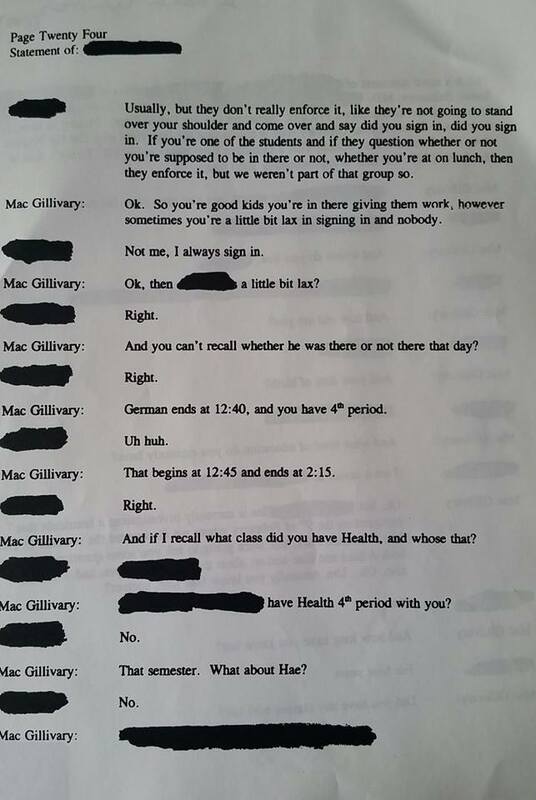 Also, the document is not complete, for some reason I only have part of it, and the redacting was already done to the hard copy, not redacted by me, and no idea why Adnan’s name is redacted from it either. That’s where the document ends. 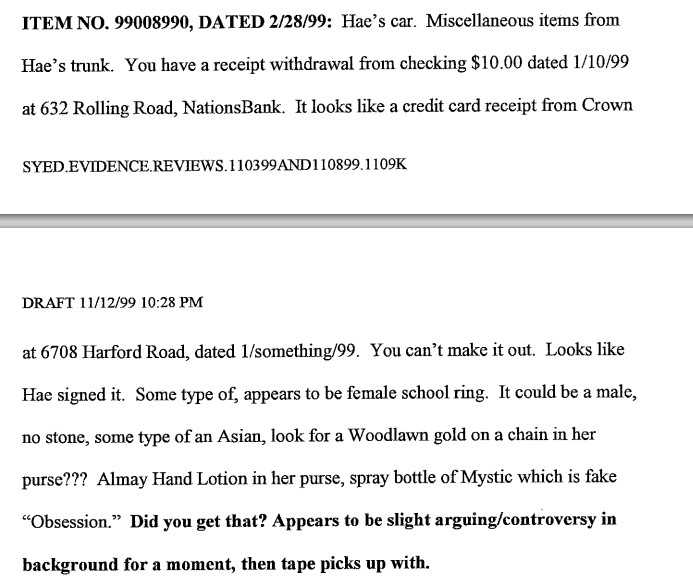 I’ll try looking for the entire thing elsewhere but so far haven’t been able to find it in my electronic documents. The important thing to note here is Adnan was seen in his track clothes, with his track bag, saying he is on his way to track, apparently sometime after he was in the library with Asia. Do with that what you will.